This blog post is about serendipity, proximity and how far we can push a compact stereoscopic 360 camera like the new Z CAM V1 (I'm still using the pre-production prototype... the production versions should be shipping very soon). Serendipity because I literally stumbled upon this shoot as I was walking around the block in my neighborhood. I saw that someone had set up a portable darkroom by the side of the road near the forest and knew that could only mean one thing… a wet plate collodion photographer was nearby. If you haven’t heard about this, the collodion process was invented in the 1850s as a way to preserve images on glass plates. The great American photographer Carleton Watkins was famous for his Yosemite collodion prints and it’s an incredibly difficult process because the plates have to be exposed while wet, necessitating an on-site darkroom. (Back in the 1850s he had to haul around literally tons of gear to do this.) Eventually the daguerrotype process replaced collodion plates, but lately this “ancient” photographic technique has been revived because of the beautifully haunting quality of the image. This is a short 10 minute experience that’s best viewed on a headset in the SamsungVR app, which is available for the Samsung GearVR and Oculus Go headsets. In the SamsungVR app please search on my last name “Yost” to find my channel (remember to click on the channel button) and before you watch this in the app, PLEASE download it locally to view it without having to deal with the resolution artifacts inherent with streaming. (The few extra minutes it’ll take to download the file is more than worth it, and you can delete it after watching to free up space.) If you don’t have a headset you can order one here for only $200. Until then, you can watch on your phone in “magic window” mode or in your browser by clicking on the thumbnail above. Lindsey explained that she’d ordered this camera over a year ago and it was just one of three that size in the world. She’d just received it from China the previous week and this was its shake-down run. She'd made the drive up from Santa Barbara because she wanted to shoot in the redwood forest (her model was due to arrive any minute) and Mill Valley had easy public access to the big trees. The Chamonix camera weighs 60lbs (!) and I helped her carry it about 20 yards into the forest... there’s no way one person can handle this camera themselves. She had a portable table to set it up on (no ordinary tripod is big enough) and a bunch of sandbags for leveling the camera. The lens she was using is a Goerz Artar 47.5” (minimum aperture f15) lens made in the 1940s. I think 47.5” means that it can be used on a view camera with a maximum bellows throw of 47.5” -- which is pretty much the max throw of that monster Chamonix camera. Lindsey and the legendary Goerz Artar 47.5" f15 lens. The biggest camera I've ever seen. While she was setting up I explained that I’m shooting with the polar opposite camera, but it was also one of just two in the world and also made in China. Of course my next question was if I could make a short 360 experience of her shooting with the most ancient of cameras while using one of the world’s most advanced cameras to make the video. Lindsey was totally into it, but was losing the optimal light and wanted to focus on getting her 2 or 3 plates done with the model (who had just shown up). I didn’t want to get in her way so went home to grab my V1 “run & gun” kit. I’ll take a moment to elaborate on how the kit is put together. Kinson Loo had recommended I buy the Thule DSLR Rolltop Backpack for the V1 because it has a side pocket with cylindrical velcro stabilizers that seems to be perfectly made for the camera! I also ordered a couple of microfiber pouches to keep the camera in so that the lenses don’t get scratched. The Thule has a tremendous amount of space. I can hold the V1, two Sennheiser AVX wireless mics (each in its own separate pocket), my AB Gold Mount battery, battery clamp for the monopod, Zoom H6 and Zoom H2n plus clamp, along with headphones and even my Oculus Go (for giving demos out in the field). This backpack, plus my Bushman Corepole and Enduro Highhat combo in a separate bag are all I need and setup is fast. The side pocket of the Thule looks like it was designed specifically for the cylindrical V1. Back to Lindsey… I returned as she was finishing up making two beautiful plates. Cleanup and packing time for a shoot like this is 2-3 HOURS, but she was totally generous with her time for our shoot and appreciated the irony (?) of these two vastly different cameras “meeting” in the forest. I threw a mic on her and in about 15 minutes captured all the footage I needed. The biggest challenge for me was dealing with the ~20 stops of dynamic range in the scene. It was very late afternoon and although the sky was still bright, the forest was extremely shady and dark. I knew I was going to put a gallery of Lindsey’s work in the “back 40” of the sphere so I just exposed for the shadows and let the highlights fall where they may (blown out, but it was all irrelevant information anyway). It’s amazing how close you can get to a subject with the V1 and that’s due to the 35mm interocular distance between its lenses… 35mm is about half of the distance of any other 3D 360 camera, which allows us to get twice as close. To see how far I could push this, I recently made a test of myself and a buddy talking in the backyard and we were each 18” from the camera. A link is below in case you’re interested in seeing what 18” of proximity looks like… IMHO too close, but the camera can actually handle this, which is insane. A much better real-world test is in this piece about Lindsey… Her pop-up darkroom was between her truck and a wall of ferns. The space I had for the camera was only 3’ wide, with 18” on either side. And I wanted to be very near her so that we could clearly see into her darkroom. If you look to your right in those shots (between 1:30 and 7:00) you’re literally inches away from the ferns that are sticking out from that wall and they look great! And there's a point at about 3:25 where she holds the 24x32" glass plate literally 6" from the lens. It's terrifying when then huge plate of glass comes right at you! This natural quality of stereoscopic imaging is unheard of and stitching was entirely automatic in WonderStitch. Other things to notice here are the amazingly naturalistic skin tones, which is another great feature of the V1. The camera is really a dream to work with. Regarding audio… I used the same workflow for this video that I developed for the Rangeland Manager piece based on Logic with Ambipan/Ambihead. Lindsey’s dialog track is on track 1 (width dialed in so that it’s a moderate point source). Her head-locked narration during the collodion-pouring sequence is on track 2 and the spatial ambient track that I recorded the next day at the same location is on track 3. The entire spatial mixing process took only 30 minutes and the result is totally immersive. As you’re enjoying Lindsey’s artwork, the spatiality of her voice is really gives you the feeling that she’s there right behind you. A stereo audio track would totally blow that deep feeling of immersion. The UI screenshot below gives you a peek at what the azimuth keyframing was like for Lindsey's dialog track... she was moving around a lot and it was fun to track her in Logic. It’s fascinating to see the dedication that artists can bring to their work. Collodion photography is the ultimate in difficult technique and yet there are many artists who will put up with the harsh conditions and challenges to create these haunting one-of-a-kind images. One thing Lindsey mentions in the video is the ISO of a collodion plate, which is between .7 and 3. Yes, 3. And she’s shooting with a lens that has a maximum wide-open aperture of f15. So her exposures are 2-5 minutes long and everything (ie, the model) has to be very still during that interval. It’s daunting but inspiring! I hope you enjoy this exploration of the creative process. Hard work and artistry coming together to inspire us and prove that obstacles are mainly there for us to overcome. This quote from the author Wendell Berry hangs on my wall to provide solace when a project (or life) is pushing against me. I read it every day and this experience with Lindsey at the local creek exemplified it in the most emblematic way. “There are, it seems, two muses: the Muse of Inspiration, who gives us inarticulate visions and desires, and the Muse of Realization, who returns again and again to say "It is yet more difficult than you thought." This is the muse of form. It may be then that form serves us best when it works as an obstruction, to baffle us and deflect our intended course. It may be that when we no longer know what to do, we have come to our real work and when we no longer know which way to go, we have begun our real journey. If you'd like to download this video for side loading into the Oculus Go, Samsung Gear VR or other VR headset, a dropbox link to the 4Kx4K 3D version is here. Stick it in your /Movies folder and please play it with the Samsung VR player instead of the Oculus Gallery or Video players... the Oculus players currently have an audio synch problem but the Samsung player will handle it perfectly. To wrap it up, here are a few more videos. This first one is the 18" proximity test with the V1. Totally nuts. 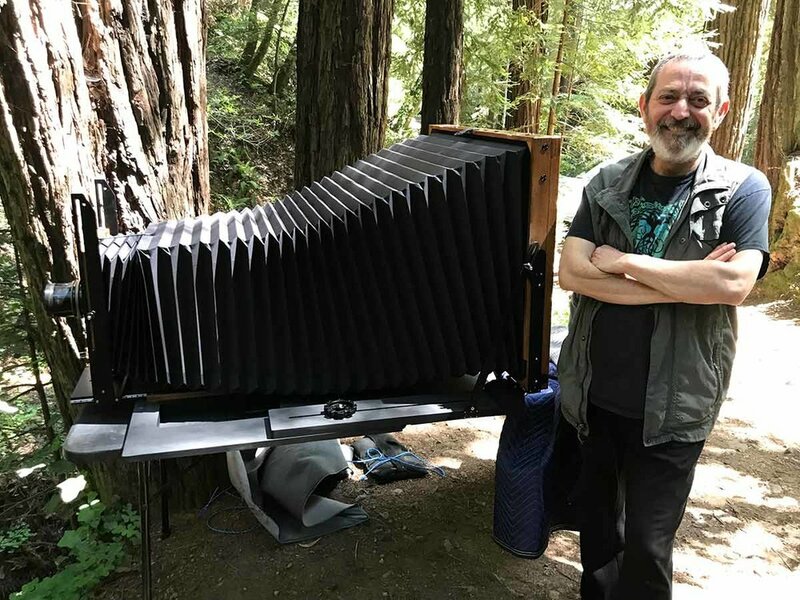 For more inspiration, here’s a short video about collodion photographer Ian Ruhter who built a camera as large as a van and has pushed the medium way beyond anyone else. If you think that producing 360 videos is hard, this will make you feel better.